When faced with the decision of where to stay while visiting San Francisco, it’s all about location and Fisherman’s Wharf, a historic and popular area is an ideal spot. Just a short walk to Pier 39, Coit Tower and Ghiradelli Square, the area is home to some of San Francisco’s most iconic restaurants and cafés. 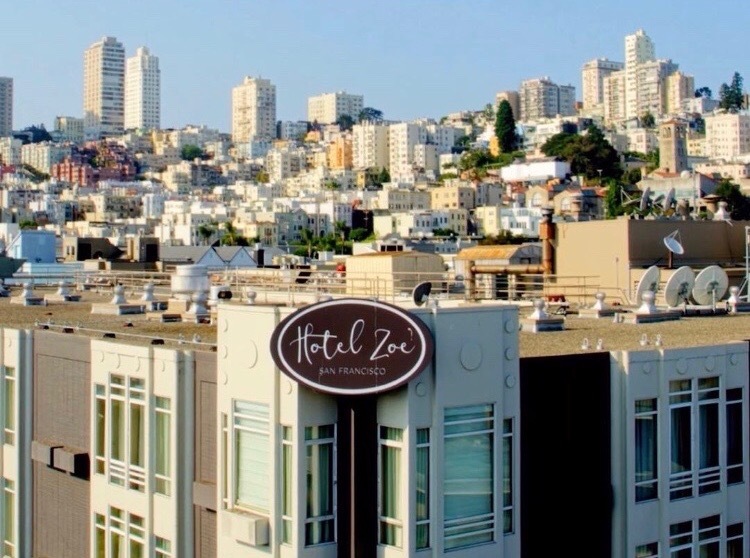 Hotel Zoe, a boutique hotel in the heart of Fisherman’s Wharf is the area’s newest property that offers wanderlust globetrotters a distinctly San Francisco experience. A TripAdvisor GreenLeader award winner for its commitment to sustainable practices, Hotel Zoe subtly implements initiatives that are good for you and the world, making it easy to travel well while visiting San Francisco. By offering complimentary bicycles for guests to get around (while cutting down on carbon emissions), stylish reusable tote bags for city shopping and water bottles to keep you hydrated when on the go, the hotel embeds sustainability into modern amenities. With an awareness and understanding of how the hospitality industry has a responsibility to protect the planet the team at Hotel Zoe carefully considers the services they offer and products they buy, keeping it local and eco-friendly. Dedicated to the promotion of good health and well-being for children, Hotel Zoe partners with Clean the World to recycle soap and provide lifesaving hygiene products to underserved communities around the world. Locally, one dollar is donated to the local children’s hospital for every room key card that is returned, or alternatively, guests can opt to give back by booking online through the ‘Hotel Zoe Gives Hope’ rate, which contributes 5% of all revenue booked to the same hospital. If you envision daily yoga at a local studio, bike rides along the wharf and green amenities for your next trip, check into Hotel Zoe and know that your dollars are ticking several feel good boxes.